If you’re lucky enough to be living in Seattle, you know that you live in a place with awesome weather, tons of cool places to go outside and play, great job opportunities, and a thriving cultural vibe. But as much as you’re enjoying your life in Seattle now, will you be able to continue to enjoy it this much when you get to retirement age? Saving for retirement is serious business, and if you are trying to DIY your retirement income planning, you could be making some costly mistakes. In our last blog post, we looked at the first mistake, but there are several more that we’ll cover in this post. Do you spend your evenings and weekends as a money manager for your personal accounts? Do you spend hours researching stock options, navigating your etrade account, and talking to your brother-in-law about what’s the best step to take with your money? Do you invest your time, effort, and focus, only to end up frustrated with how the stock market performed, money you lost, and mistakes you made? This is an all-too-common scenario for people who are managing their own money. While no financial advisor can ever guarantee that you won’t lose money, they can provide service that’s on the cutting edge of knowledge of the financial industry. They’re less likely to make rookie mistakes. They’re more able to assess risk, identify which deals are more sketchy, and steer a sure path through the financial waters. 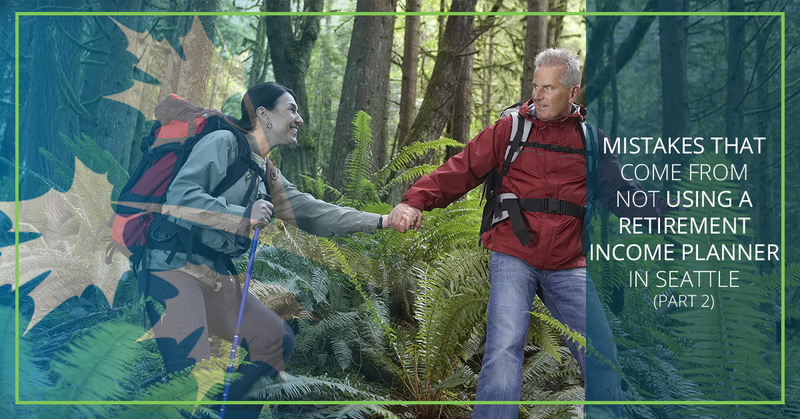 Take the stress off your plate and reclaim your scarce time and energy for things that you care about by letting a financial advisor guide your retirement income planning. Matt Nelson and Income for Life are proud to serve clients in Seattle with Top Rated National® retirement income planning services. Contact us today to get started. Retiring is easy, but staying retired is difficult. The minute your income stops flowing and you start living off your retirement, you begin drawing from an ever-diminishing pool. As your savings dwindle and inflation slowly kills your purchasing power, will you outlive your retirement account? You don’t want to spend the last years of your life barely scraping out an existence because your retirement fund ran out five years before you died. Do you have the tools to accurately project how much you’ll need for retirement and whether your money will last? Are you in danger or finding out too late that your retirement plan wasn’t a viable one? A financial advisor who specializes in retirement income planning can make sure that you avoid the mistake of retiring with too little in your account. Many people mistakenly think that staying retired is matter of merely having a humongous lump sum in the retirement account, but it isn’t quite that simple. A retirement income planner can provide you with a number of tactics, tools, and techniques that you can employ to give you the best chance at staying retired. One of these options is an annuity that will give you regular monthly payments throughout your retirement. Fortunately, it’s easy to avoid these common mistakes simply by working with a retirement income planner. Maximize your retirement payments—and the longevity of your retirement account—with the help of a professional. Get started when you contact us today.